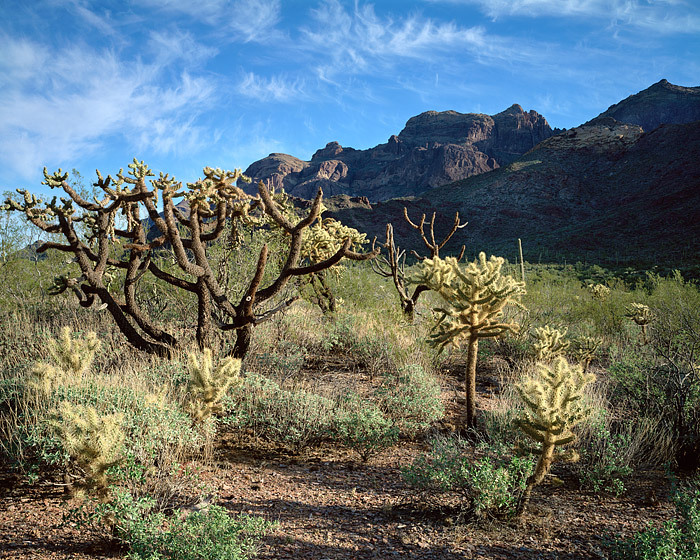 Wispy clouds drift over Arizona's Ajo Mountains deep in the Sonoran Desert. Organ Pipe National Monument is deceptively vibrant and lively on this spring day. Organ Pipe, named for the large Organ Pipe Cactus that are found here is a hodgepodge of Sonoran Desert life. Cholla, Brittle Bush, Saguaro Catus and Organ Pipe Cactus dot the rocky landscape only a few miles from the U.S.-Mexico border. Photo © copyright by Thomas Mangan.